Spinnaker is an active adult community located along Long Island Sound in coastal southern Connecticut. Six models were offered in this single-family condominium community. The models were primarily single level or master-down plans in the 1500-2300 SF range. 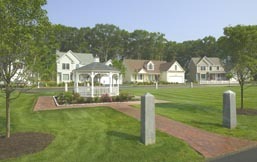 Common amenities included two community greens with homes on the perimeter and significant wooded open space.